The CVM Election Model is projecting that the NDP will win zero seats in Ontario (with the Liberals winning 90 seats), and that the Liberals will win all 32 seats in the Atlantic region. While this is not necessarily impossible, it does seem unlikely. Awesome post by the way! I used to write stuff like this but writing in newspapers made me give up a lot of these technical posts. I should do it more often. 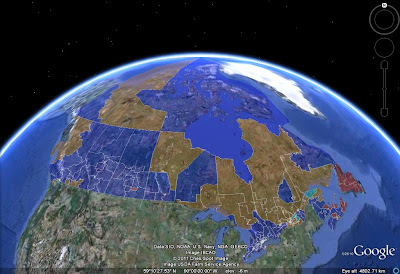 And now it appears that the Liberals have indeed won all the seats in Atlantic Canada... Crazy like a fox? Ha, yeah. Though they projected the Atlantic sweep on L53, N22, C21 vote. Actual vote was L59, N18, C19, meaning L-C and L-N gap 8 and 10 points larger than they projected. A few races were decided by less than that. And the NDP zero seats in Ontario sure didn't come to pass. Bryan: Are you gonna lose it now? lol yeah I'm not super happy. The Signal got it more right by having the NDP much more behind the Liberals in Quebec in votes, although I don't really get how they got the Liberals at 33% given the polls. Especially since they don't do like 308 and give the latest poll a much higher weight. As for CVM, well honestly, that doesn't make sense. Great, they got the seats very close... I still maintain this is most likely luck. I'm guessing that with the actual %, they'd have the Liberals above 200. I maintain that a Liberal minority was the correct "call" given the info we had. Probably higher than what I had (should have trusted these last minute polls more) but not at 170. Wait, isn't The Signal's Liberal vote share for QC 29.4%? Yeah, CVM is indeed crazy. 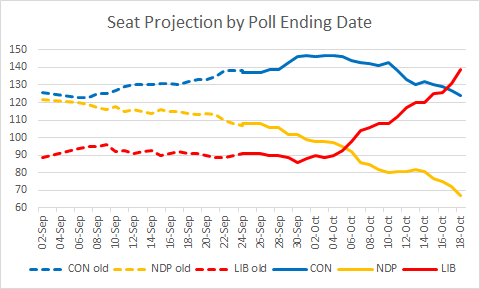 For what it's worth, using uniform swing on the actual results, my adjusted polling averages should still have given the Liberals 170 seats (ATL 29, QC 31, ON 80, MB/SK 8, AB 5, BC 14, Terr 3) instead of the 142 (146 without riding adjustments) I projected. That's a big miss. The Liberals didn't just win more ridings than expected, but won many of the unexpected ridings by large margins! 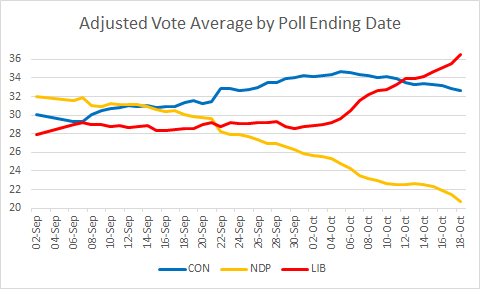 However, using actual results, my model (stripped of riding adjustments) would have given 173 to the Liberals, which is not too bad. It would have given Liberals, by slim margins, many ridings that they actually won by a lot.